The EU's chief Brexit negotiator has told the European Parliament that the Withdrawal Agreement reached last November "is and will remain the only available treaty". 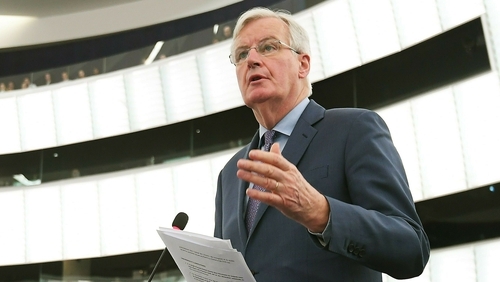 Michel Barnier said that in agreeing to draw up documents clarifying the terms of the agreement in Strasbourg on Monday, "we went as far as we possibly could in order to help the UK government get the support of the House of Commons". Mr Barnier said only Britain could chart a way out of the stalemate after MPs rejected for the second time the EU's divorce deal agreed with British Prime Minister Theresa May. "If the UK still wants to leave the EU in an orderly manner, this treaty is - and will remain - the only treaty possible," Mr Barnier told a plenary session of the parliament. He added that the EU side remained "calm, united and respectful". Mr Barnier said it was now "the responsibility of the UK" to suggest a way forward. "They have to tell us what it is they want for their future relationship," he told the parliament. "What will their choice be, what will be the line they will take? That is the question we need a clear answer to now. That is the question that has to be answered before a decision on a possible further extension. "Why would we extend these discussions? The discussion on Article 50 is done and dusted. We have the Withdrawal Agreement. It is there. "That is the question asked and we are waiting for an answer to that." European Commission vice-president Frans Timmermans told MEPs: "I don't see any better solution than the Withdrawal Agreement with all the clarifications given." He said: "Brexit is very harmful to the United Kingdom and to the European Union, but it is our duty, on the basis of a vote of the British people, to work towards a Brexit that does as little harm as possible. "This position will not change, but today we are in the hands of the British political system. "They should tell us where they want to go from now. The solution will have to come from London and we will take it from there." The European Union should reject a request from Britain to extend its Brexit deadline unless MPs rally around a clear objective for what they want to achieve, the European Parliament's Brexit coordinator said. Guy Verhofstadt said that extending Brexit beyond the 23-26 May EU legislative election would allow Brexit supporters to hijack the European debate. He said that extending Brexit "even for 24 hours" beyond the current deadline of 29 March should only be done if the British parliament had a clear plan. He accused both the Conservative Party and Labour of using Brexit "like a bullet in a weapon" rather than an existential question. He appealed to MPs: "Please make up your minds!" Mr Verhofstadt claimed "Britain is spinning out of control" when Brexit was supposed to be claiming back control. Fine Gael MEP Sean Kelly has said the EU should offer the British government a three-month extension to Article 50, without any conditions. Mr Kelly told MEPs in Strasbourg that the European Commission should "act in good faith" and make the offer to avoid a hard Brexit. Ulster Unionist MEP Jim Nicholson said it was "simply not good enough" for EU negotiators to say the sole responsibility for resolving the Brexit impasse lies with London. Mr Nicholson said the Withdrawal Agreement was "flawed, damaged and will not work" and argued that therefore an extension to the Article 50 deadline was required to find a sensible solution which suited all sides. European Commission spokesman Margaritis Schinas has said there has been no request from the UK for an extension to Article 50. He said: "Should there be a UK reasoned request for an extension, the EU27 will stand ready to consider it and decide by unanimity. The EU27 will decide, giving also priority to the need to ensure the functioning of the EU institutions and taking into account the reasons for and duration of any extension." Mr Schinas said that the EU would "analyse" the UK's offer on tariffs in a no-deal scenario to see whether they conform with World Trade Organisation law and the EU's rights. But he said that the EU had already made clear that after a no-deal Brexit, imports from the UK would be subject to tariffs at the same level applied to other non-EU countries under the WTO's Most Favoured Nation (MFN) rules. "The differential treatment of trade on the island of Ireland and other trade between the EU and UK raises concerns," said Mr Schinas. "In the event of no-deal, the Union has already made clear that it will apply its normal third-country trade regime to all trade with the UK, and accordingly charge MFN tariffs on imports from the UK into the EU. "This is essential for the EU in order to remain a reliable trade partner to the rest of the world, including upholding internationally-agreed rules on global trade." "We have seen these UK plans and we will analyse them. "We remain determined to avoid a hard border. The EU will ensure the integrity of the single market and customs union under all scenarios. "We are convinced that since no other solutions have been identified, the backstop is currently the only one available option to fully address the challenges of the land border."